I don’t know whether anyone actually reads this; that last post, about audiobooks, got absolutely zero reaction. But I’ll go on posting, if only for my own amusement. I’m cleaning my office to get it tidy enough to be seen by prospective buyers, and this has meant turning up lots of long-forgotten memorabilia. (Yes, I recognize the inherent conflict in “forgotten memorabilia.”) Some of these items resulted in a rush of nostalgia, a flood of fond memories. 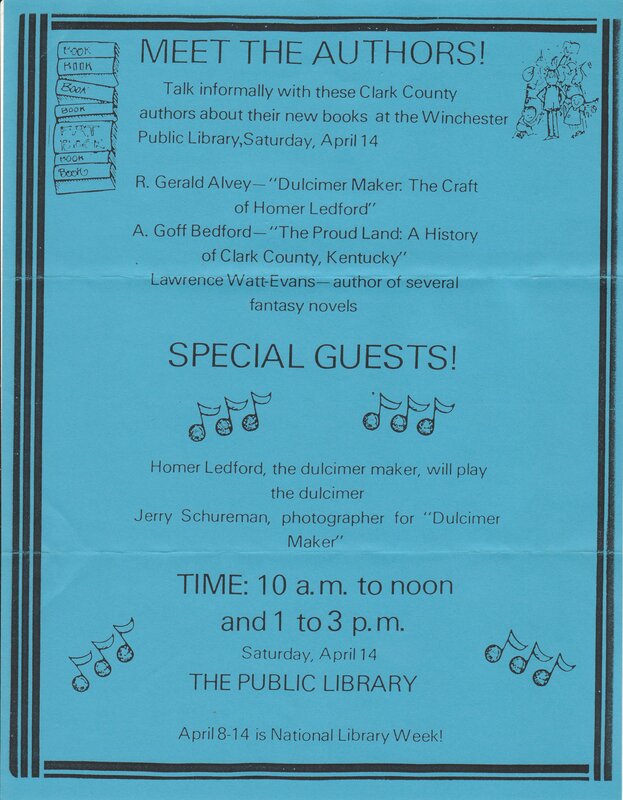 In this latter category is a flyer for a “Meet the Authors!” event at the Winchester Public Library some long-ago April. Winchester is the county seat of Clark County, Kentucky, where we lived from 1983 to 1986, so presumably this event occurred in that time period. I don’t remember it at all. There were three authors scheduled to appear, quite likely the only three who lived in Clark County: R. Gerald Alvey, author of Dulcimer Maker: The Craft of Homer Ledford; A. Goff Bedford, author of The Proud Land: A History of Clark County, Kentucky; and me, author of, it says here, several fantasy novels. Also in attendance: Homer Ledford, the subject of Mr. Alvey’s book, playing dulcimer. I have attended many local book fairs of one sort or another, but honestly, I don’t know why; they’re never my natural audience. Whether it’s as small-scale as the Takoma Park book fair held every year in a church basement, or as large as the Kentucky State Book Fair that took over the armory in Frankfort one year, I’m always out of place at such events, wasting my time by participating. Local book fairs don’t attract people interested in books; those folks go to bookstores. They attract people interested in the place holding the event. Messrs. Alvey and Bedford and Ledford presumably drew crowds who wanted to learn more about their own little corner of the world: Clark County, home to a famous dulcimer-maker. Someone writing about fantasy worlds, wizards, and dragons was utterly out of place. At the Kentucky State Book Fair the writers who had brought illustrated volumes about Kentucky’s landscapes or Kentucky’s horses or Kentucky’s role in the War Between the States drew enthusiastic crowds, while I sat there bored and ignored, chatting in a desultory fashion with the almost equally bored poet in the next seat. No one knew what to make of us; we lived in Kentucky, but our books weren’t about Kentucky. In Gaithersburg or Takoma Park the crowds (such as there were) weren’t quite so parochial; since both cities are in the suburban portions of Greater Washington, books about politics or American history in general were greeted with some enthusiasm. Even a murder mystery or historical novel might garner some attention. But fantasy? No. Even when I tried to focus heavily on One-Eyed Jack, a horror/dark fantasy novel whose protagonist lives in on Maple Avenue in Takoma Park, at a Takoma Park Book Fair, no one was interested. Too weird. So I no longer do book fairs, or bookstore signings. Why waste everyone’s time? And this flyer for the Winchester event is going in the recycling bin, not moving on to our next home with us. Posted on April 9, 2018 by Lawrence Watt-Evans in Strange Days, The Writing Life. I still read but I have little to say about audiobooks. You doing Balticon while you’re still fairly local (next month)? Yeah, I’m planning to be at Balticon at least a little. Probably the last time. Depends how the schedules work out, but probably. IIRC, you were born a few towns over from me in Massachusetts. What brought you to Kentucky, yet was so uncompelling that you left just a few years later? We lived in Kentucky from May 1977 to November 1986, just mostly in Fayette County, rather than Clark. We were there because IBM hired Julie straight out of college — they needed an ink chemist and she had degrees in bio and chem. They put her to work developing typewriter ribbons (she has a patent on a re-inking system, No. 4,504,840 — the “et al.” is her assistant and her then-boss who needed the invention points) and printer ink. The IBM 6640 Document Printer, which was obsolete almost as soon as it was released, used her ink formulation. But then in 1986 IBM Lexington, which was mostly a typewriter factory, hit rough economic waters. Julie got transferred to IBM Gaithersburg, in Maryland, to do customer support for a hospital computerization system. They figured her bio degree, and her background as the daughter of a nurse and a VA hospital physical plant supervisor, would be helpful — she could translate between medspeak and techie. They spun IBM Lexington off as LexMark, a printer company, shortly thereafter. The hospital system flopped because one of the promised vendor software systems turned out to be vaporware; they put her on hold in software testing, and in 1991 she said “Screw this” and went to work for the Bureau of Engraving & Printing instead, which is where she’s been employed ever since. I can work anywhere, of course, so I didn’t mind relocating. As for why we were in rural Clark County in the first place, we’d decided we wanted to try country living, and bought thirty acres in Dry Fork, Kentucky (a.k.a. Pinchem). We discovered we didn’t like it, so that 1986 transfer to Maryland was very welcome. I for one miss your updates. I’m not a huge commenter anymore and this particular blog software makes commenting cumbersome. I’ve noticed you have moved most of your writing updates to twitter. Alas, I’m one of the social media holdouts so can’t follow that as efficiently as I can blog posts. If commenting here will get you to write more here I’ll definitely do that. Now to comment on the post in question. I know you have been looking at your next location for a few years now. I guess you have decided where that is going to be since you’re preparing to put your house on the market? Congratulations on the move and good luck with the prep work. Having just sold our house, I am intimately familiar with the stress that comes with cleaning out 20+ years of accumulated stuff. Actually, we don’t know for sure where we’re going, but Julie is retiring in September and we know we don’t want to stay here, with the miserably hot summers. The plan is to be homeless for awhile and travel, and when we’re ready to settle down again, we will. The current Plan A is to settle on Bainbridge Island, WA, but it could change. I do mostly post to Twitter, and via Twitter to Facebook, because that seems to be where most people are. The more feedback I get here, though, the more I’ll post here. And then there’s my Patreon page, and the e-mail newsletter. The newsletter is roughly once a month, and pretty much focused on writing news. The fact is, there are too many outlets to keep up with effectively, so I tend to focus on ones where I get responses. Yeah, I still read your blog, too, but I don’t really do audiobooks. And, I mostly read it via a RSS feed reader, so you might not even register me reading it in your statistics. I never look at the statistics, to be honest. I probably should. I don’t listen to audiobooks, either, as a general thing, but since I have readers… Hmm. Is that the right word? “Fans” sounds too boastful, but you don’t actually read audiobooks. Okay, since I have listeners who like audiobooks, I try to oblige them. Another datapoint: I read this blog occasionally; don’t do twitter or facebook. I also prefer to read books on paper, so didn’t have any strong opinions on the audiobook question. I listen to audiobooks from time to time. It depends on how hectic life gets. When I find it’s been months since I had the time to read for fun, I tend to drop an audiobook onto the USB connected to my car stereo (Honda Fit has a USB interface to the stereo in the top glove compartment) or one of the MP3 CDs I bought from Tantor Media. At least that guarantees I get some listening to books in while I’m driving around running errands. Looking at 1980-1989, the only time April 14th was a Saturday was in 1984. (4/14/1990 was also a Saturday, but from other comments you were already in MD by then). Thanks, but If I cared I’d have looked it up myself. As a frequent attendee of local F&SF conventions, I fear they’re headed in a similar way as far as author signings. Except for the Guest of Honor, signings seem to be sparsely attended and are mostly the same authors at convention after convention, hanging out with friends in case someone shows up. Even more, however, is the sad sight of so many self-published and small-publisher authors with tables in the dealers room, glancing up with hope at everyone who walks by their table, some of them calling out to passersby to try to get them to stop by and talk to them, hoping the attendees will buy enough books to cover the cost of the table, membership and hotel (or the cost of gas). As for this blog, I had never really looked for it before now, so I’ll peruse the old entries. I think blogs are useful if you have something you want to share on a regular basis (some authors talk about their writing, or their music, or their other hobbies (baseball, martial arts, collecting things, etc. ), or as a sort of impromptu memoir) or as a special case for longer topics you can’t really address properly on other social media (which get pointed to by the primary social media platform you use as your central clearinghouse), but the cost-benefit analysis of maintaining the site is up to you, of course.